We are open 6 days a week, closed on Mondays (except for Bank Holidays). Any other closures for private events will be advertised. Admission is FREE, except on event days when charges will apply as advertised. Our normal opening hours are 11 to 4pm. Opening days and/or hours may vary for special events or as a result of private bookings, please check events listing or ring for details. On event days special access arrangements may apply, please follow signposts / directions. We open for 2019 on Tuesday 2nd April. The site offers FREE parking for cars and up to 5 coaches. Dogs are welcome but must be kept on a lead and supervised in the castle. Wet weather facilities can be provided for lunch by arrangement. Our Tea Room & Coffee Bar on site can provide ice creams and snacks or you can bring your own picnic. Accessible Toilets are available in the Country Park car park and inside the castle near to the cafe. 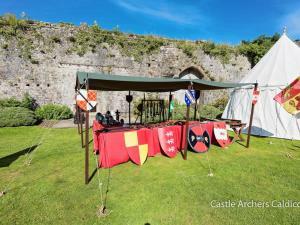 Caldicot Castle's courtyard and lawns offer level access with paved and light gravelled areas. Towers have spiral staircases and many doorways are narrow. Seating is available in the grounds and towers and in the Country Park. Staff are happy to advise on access prior to or during a visit. Using Google Maps use NP26 4HW which will take you to the Castle Inn pub and Church which is on the end of our drive. From M4 take junction 23a and B4245 to Caldicot. From M48 take junction 2 for Chepstow and follow A48 (towards Newport) and B4245 to Caldicot. Caldicot Castle is sign posted from B4245. Caldicot Halt is served by mainline services between Cardiff and Gloucester. From Bristol change at Severn Tunnel Junction. The castle is about a twenty minute walk from the station. Bus Services run to Caldicot from Bristol, Newport and Chepstow. From The Cross, the castle is about a five-minute walk along Church Road.